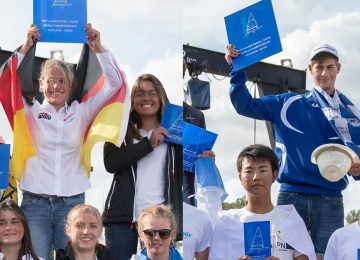 Emma Plasschaert BEL had entered yesterday to the Laser class Hall of Fame, winning her first World championship title at her 24 years old and also achieving first Gold medal in the Laser Radial class for Belgium. A bright and breezy day in Denmark’s Bay of Aaarhus provided a perfect scenario for an amazing Medal Race. 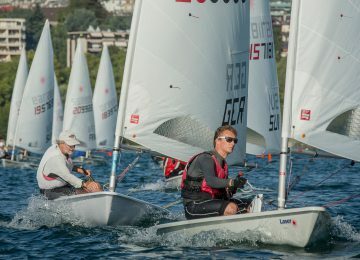 Emma started the day 11 points clear and needed to be sixth or better in the 10-boat field to claim Gold. 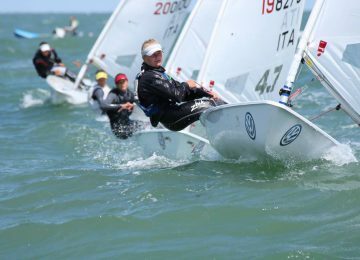 After a fierce run with 2017 champion Marit Bouwmeester NED, she could finish fifth and just one boat behind Dutch sailor in fourth. “I knew Marit was so good in these conditions, so I was a little bit afraid she would jump over me”, Plasschaert said. “I’m feeling amazing and overwhelmed to win the World Championship. It’s my first big win, it’s my first Gold in a championship”. “The key to winning here was being consistent”, she said. “The conditions are so tricky, and I just needed to be up there every time. I was trying to have good starts and not be too extreme, but also stay attached to the front group”. “I think over the recent months I have just stepped up my mental game a lot and worked on my on-water strategies”. Marit Bouwmeester’s great comeback on the end of the Final series hadn’t been enough for her to get a new Gold medal in her amazing career. Silver is a great achievement anyway but probably not for her; “I left myself a lot to do, 11 points is a lot”, she said. “She (Plasschaert) has been very consistent. 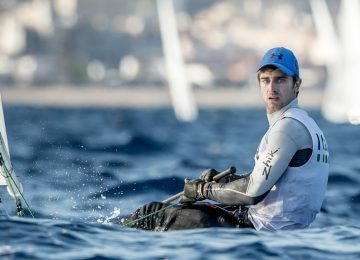 I think I underestimated how difficult it is sailing here and did not spend enough time training here”. 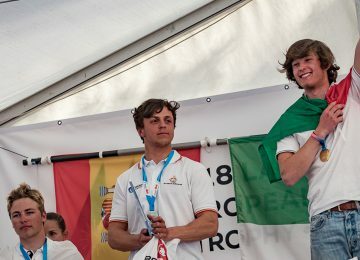 The battle for bronze was more intense with just six points separating four boats going into the medal race. Denmark’s Anne-Marie Rindom started in third, but watched her rivals line-up to take the bronze from her. But as she said on the slipway before they headed out into the strong wind, “My nickname is the bulldozer, so they better watch out”, She had hammered her way up to third by the second downwind and bulldozed on to Bronze.